Eymardian places are the heritage of the life and work of the French saint Peter Julian Eymard (1811-1868). Eymard was a priest whose spirituality was centred on devotion to the ‘blessed sacrament’ or Eucharist, which is the sacrament of Jesus Christ’s death and resurrection that Catholics commemorate in the liturgical celebration of the Mass. During Eymard’s lifetime, the character of French Catholicism was changing from a religion of guilt and fear to a religion based on God’s mercy and love. Eymard was a leading figure in this transition. He was the founder of two religious congregations dedicated to the love of God made present in the Eucharist. His own religious institute of priests and brothers, known today as the Blessed Sacrament Congregation, was established in 1856. 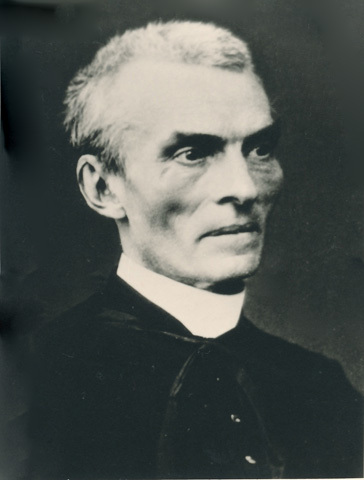 Two years later, he collaborated with Marguerite Guillot (1815-1885) to found a eucharistic congregation for women now known as the Servants of the Blessed Sacrament. He also established an association of lay people called the Aggregation of the Blessed Sacrament. In 2010 and 2011, during the 200th anniversary celebration of Eymard’s birth, pilgrims travelled from around the world to discover the Eymardian places in France. More pilgrims are making their way during 2012, which is the fiftieth anniversary of Eymard’s canonisation as a saint. Eymard was a pilgrim throughout his life. He journeyed long distances to places that brought him closer to God. The power of these places remained with him and brought him back, to reflect and pray, to give thanks, and to be restored by his experience of God. Eymardian places are places where Eymard found God. They are also places where we may find Eymard. As pilgrims, we walk in his footsteps. We look for him in the churches and shrines that he loved, in the villages and cities where he lived and worked, and where events occurred that were important in his life. The Eymardian Places website was originally compiled as an online resource for a group of pilgrims from Australia who travelled to France in October 2011. Information is provided here about many, but not all of the Eymardian places. It is hoped that more places and more resources will be added to this website in the future.